The sound, and sight, of Redstarts enlivening our deciduous woodlands is now almost restricted to the eastern hills of Cheshire. In the First Atlas they were sparsely distributed across parts of western and south-western Cheshire, as well as SJ86 and SJ87, all areas from which they are now missing. In those twenty years they have been lost from 37 tetrads, with just 10 gains, and their range has contracted so that half of Cheshire’s tetrads with Redstarts are now at altitudes above about 250 m. Surprisingly, only 60% (27/ 45) of the submitted habitat codes were broadleaved or mixed woodland, and five of the 13 instances of confirmed breeding were not in woodland, the rest being in scrub, rural human sites and grass moorland. It probably needs an expert ecologist to study the fine differences in habitat requirements between Redstart, Wood Warbler and Pied Flycatcher, to explain why the Redstart is so restricted to our eastern hills, and why Redstarts have contracted in range in Cheshire during a time when the national population is stable or expanding. Their national population has risen from a low point in the mid-1970s, probably recovering following the worst of the Sahel droughts. 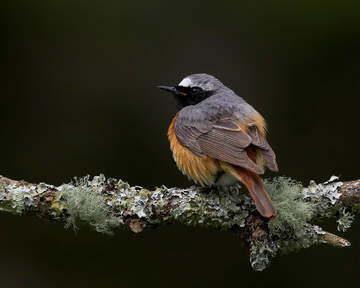 Redstarts winter south of the Sahara, in the soudan and guinea savannah belts from central Senegal southwards to Sierra Leone and countries to the east. They have to pass through the Sahel zone and perhaps were hit by the widening of the Sahara and reduced opportunities for pre-migratory fattening in spring. BTO indices show that the recovery in their population continued until the late 1990s, helped by improving breeding performance and progressively earlier laying dates, and their numbers are now roughly stable, and slightly higher than twenty years ago. The reduction in Cheshire Redstarts is not easy to explain. The males arrive in late April after the leaves break and usually sing from the tree canopy, making them often extraordinarily difficult to see. They are, however, very demonstrative if the nest area is approached, scolding the observer with their loud ‘hwee-tuck’ alarm, what seems to be a very appropriate mixture of calls typical of the warbler and chat families; some birds repeat just the first or the last part alone. Redstarts are unusually versatile in their choice of nest-hole. Cheshire nests have been recorded in tree-holes including old woodpecker holes and nest-boxes, cavities in stone walls, even holes underground. They usually prefer a larger entrance hole than those chosen by other similarly-sized birds. The folk-lore amongst ringers studying the species is that they like to occupy dilapidated nest-boxes, often in the last year before they fall apart. The male selects the nest, singing to attract a female to it. In a seldom-seen display described by Buxton (1950), he signals from inside the hole using his two most prominent plumage features – the white frontal patch and the red tail – which are emphasised in the French name of the species: ‘rouge-queue à front blanc’. [The male then stops singing for a few days whilst his mate builds the nest, swirls of grass lined with fine grasses and feathers. The drabber female lays an average of six or seven pale blue eggs, and she alone incubates them as the male resumes singing. The BTO’s nest records analysis shows that Redstarts have advanced their first-egg date by a remarkable 11 days in just twenty years from 1984 to 2004. The chicks typically hatch in the last week of May, and it is then very easy to prove breeding when the adults conspicuously carry beakloads of food back to their brood. Redstarts feed in the lower reaches of trees and on the ground, with males especially taking a lot of their prey by aerial flycatching and hovering at the tips of vegetation.] The adults eat fairly large insects, especially adult hymenoptera and beetles, and feed their young a similar diet but with more spiders, especially when the chicks are small (BWP, Buxton 1950). Exceptionally, they may have two broods, but none has been reported in Cheshire. The confirmed breeding records for this Atlas came from observations of birds at nests (5), adults with food for their young (3), and recently fledged young (5). Not much is known about site fidelity and recruitment to the population. One bird in Delamere Forest, ringed as a chick in 2002, returned to the Forest in 2003 to breed in a natural hole about 1 km from her natal site, and in 2004 again bred in the same territory, with the same male as in 2003, both times using old Great Spotted Woodpecker nests in decaying birch trees just 50 m from each other. Most sites seem to hold just one or two pairs, and the Cheshire total of breeding Redstarts is unlikely to be much above 50 pairs.